One of the most astonishing miracles in the Bible is found in Acts 19:11-12. This hearkens back to Jesus healing the woman with the issue of blood in Mark 5:27-29 when she simply touched His garments. The point is not that Paul was equal with Jesus but that Paul was connected to Jesus. Jesus was working through him. Sadly, many folks today cannot see this story for what it is. They believe it is an example of how God’s people would work for all times. They expect to find men through whom God is working in a miraculous healing ministry today. They do not recognize that God had chosen this time as a very special time of revelation. As His New Covenant was being taught, He provided confirmation by working these miracles through the ones He sent (cf. Hebrews 2:2-4). In other words, God did not empower Christians to work these miracles as simply another part of Christian living. He empowered certain Christians to work these miracles as a testimony that they could be trusted as God’s mouthpieces. This hearkens all the way back to Moses as he asked God, “What if the people don’t believe I’m really speaking for you?” (cf. Exodus 4:4-9). God gave Moses signs to show the people that eventually led into the 10 plagues. I Corinthians 13:8-13 demonstrates that the miraculous gifts, including prophecy, tongue-speaking, and healing (I Corinthians 12:4-11), would cease when that which was perfect, complete, or whole had come. Do not take this statement out of its context and just apply it to Jesus. In the context, there is something that is partial and something that is complete. As in all cases, the complete is the same as the partial but in completed form. Consider if I gave you a part of an apple pie, what would the whole or complete thing be? It would be an apple pie. If I gave you part of a car, what would the whole thing be? It would be a car. If I gave you one chapter or part of a book, what would the whole thing be? It would be a book. If I was giving you part of a teaching, what would the whole thing be? It would be the whole teaching. In this context, the part refers to the miraculous gifts and what they provided. “We know in part and we prophesy in part” (I Corinthians 13:9). That referred to the teaching and the knowledge produced by it. Going back to Hebrews 2:2-4, we learn that the miraculous gifts were the revelation and confirmation of God’s will. What then is the whole? It is the completed revelation and confirmation of God’s will. The whole, the perfect, the complete in this context refers to the giving of all the knowledge of God and His will that God wants us to have. Once that came, the miraculous gifts, along with the gift of healing would cease. That leaves us with two options. Either one, God still has more scripture to reveal, or two, all scripture has been revealed and God no longer empowers Christians with miraculous gifts. Since I accept the Bible as God’s completed word, I accept option two. There is another reason I accept the second option. As seen in Acts 8:9-25, the real power of God stands out over fakery. When God really works miracles through people it stands out. I’m still waiting to see that power displayed to prove me wrong about I Corinthians 13. Some will say that I’m closing my eyes to what is going on in the world. They’ve seen the miracle workers on television. They’ve heard the stories. So have I, and they have always come up short of God’s working. In fact, 10 years ago, when I lived in Beaumont, Texas, I attended one of Benny Hinn’s miracle crusades. I wish I could tell you that I saw the working of God that night. But I didn’t. I saw an expert showman, practiced in the art of misdirection and sleight of hand. He was an entertainer like David Copperfield or Penn and Teller. The difference is those men admit they are performing tricks. Men like Benny Hinn misguide people claiming to be the great power of God like their spiritual predecessor, Simon the Sorcerer. However, unlike Simon, they won’t repent. On Friday, February 12 , three of my friends and I went to Benny Hinn’s Miracle Crusade. During the collection, a screening process took place on the floor of the Montagne Center. Instead of all the people just getting out of wheelchairs, “walking and leaping and praising God” (Acts 3:8), ushers helped some of them up and supported them as they tried to walk. We were saddened when some ushers tried to get one poor little girl, who was about five years old and evidently suffering from Cerebral Palsy, to get up and walk. The ushers had to hold her up because she could not walk. She could not even hold up her head. After several attempts, they gave up, putting her back in her wheelchair. One man, who had supposedly been in a wheelchair, was able to walk on the stage. Benny Hinn proclaimed him healed. However, when he was sent off the stage, he had to be carried down the stairs and carried to his chair. When Jesus healed the paralytic in Mark 2, Jesus told him to pick up his pallet and walk (Mark 2:11). He didn’t have to be carried anywhere. Benny Hinn tried to get another “healed” woman to run across the stage with him, however she could not. She said, since she had not used her knees in six weeks, they were weak. When Peter and John healed the beggar, he went “walking and leaping and praising God” (Acts 3:8). He did not have weakness from lack of use. More disconcerting than what we saw, however, was what we did not see. There were no miracles, even though there were many people (like the little girl) who had visible handicaps. When Jesus or the apostles performed miracles, all who were present knew a miracle took place (John 11:45-47; Acts 3:9; 4:16). This was disconcerting because Benny Hinn asked for money in exchange for miracles. He asked the people to give $1000, $500, or $250. He told people not to give anything less than $100. Benny Hinn took the money. But he did not deliver any miracles. When a person asks for money in exchange for a service, takes the money but does not perform the service, we call that stealing. “What Would Jesus Do?” Would He advertise and sensationalize His healing ministry? Would He ask for money in exchange for miracles? Would He promise miracles and not deliver? 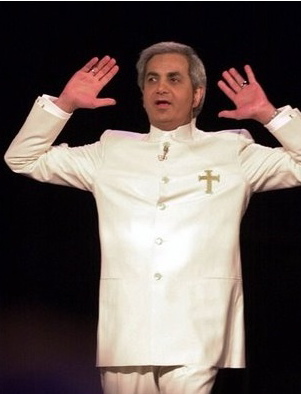 Benny Hinn does not do what Jesus did! Let us turn away from flashy sensationalism and get back to the Bible. You have to pay for the sensationalism; you can study your Bible for free. That is where the true healing of our souls can be found.